Sometimes, we need debug program, because static analisys can't cover all our hopes. Sometimes we need run program to see value of register or variable. For usual program it is so simple - just start any degugger, load program, run and debug, debug... But, not for bootloaders, even more for embedded platform. But this is also possible. 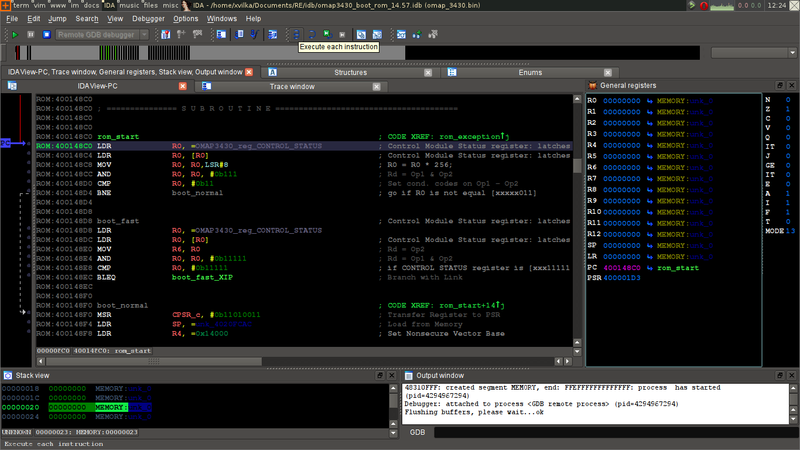 We need to know that we are luckies - qemu (now - the best system emulator) support gdbserver mode, which allow run everything you want in qemu, stop, and then connect from any other place with gdb or it's frontend to the running qemu, as for real hardware. But, if PC emulation support BIOS loading/debugging, mainstream QEMU doesnt support such thing for ARM. Here you can find patched qemu, for support booting and debugging bootrom, and bootloaders. Also here you can find examples of its use. It stopped with signal SIGTRAP, Trace/breakpoint trap. 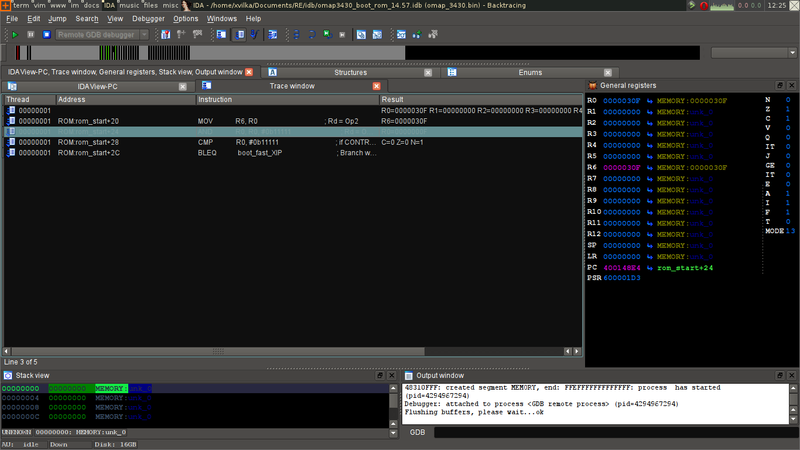 First, start IDA Pro, open idb for your file, go to menu Debugging -> Debugging Options -> edit all that you want For start debugging just open Debugging -> Attach to process -> Remote GDB debugger -> localhost:1234 (if you use "-s" option for qemu) run! This page was last modified on 3 July 2016, at 22:20.